We don’t need excuses to go out for a good meal, but this announcement from Craigie on Main gave us an opportunity to correct two omissions at that restaurant: we had never experienced the late evening “Chef’s Whim” dinner, and two of our friends had never eaten there. The only decision we’d have to make was choosing a wine to accompany our meal, a responsibility I was able to delegate to one of our guests who works at Central Bottle. 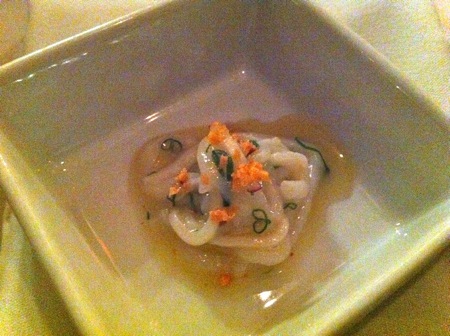 The amuse was squid “noodles” in a nam pla based dressing, topped with something crunchy (I told you the descriptions wouldn’t be complete). Very refreshing. Tuna “confit” on baby red bliss potato slices, topped with hackelback caviar and chervil, accompanied by toast crisps. 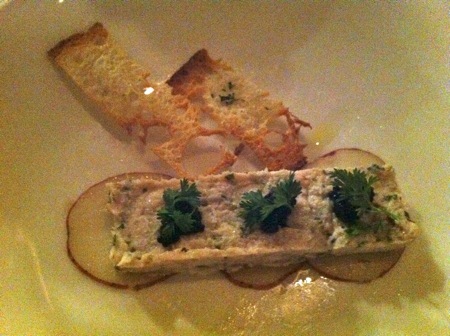 Not really a confit, more accurately a rillette, but nicely balanced and not too salty. 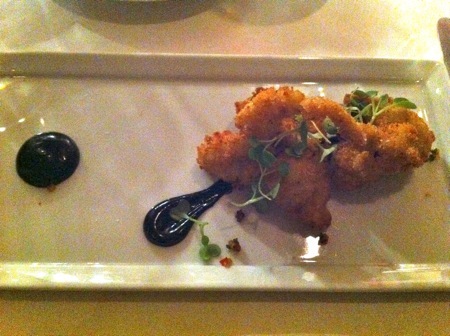 Fried Maine clams with preserved lemon, olive tapenade, and squid ink. The clams were exceptionally tender with a light but crisp breading. Alone, they seemed under-seasoned, but eaten with the tapenade and lemon, they acquired the requisite citrus and salt components. 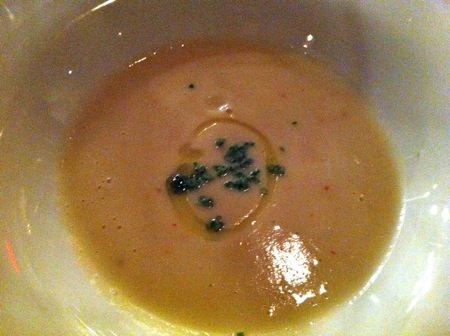 Potage of Jerusalem artichoke with olive oil and chives. There was a subtle heat to this dish that lifted it out of “puréed root vegetable” territory. I would have happily eaten a second portion. Crispy duck leg confit with barley, sautéed kale, and broth. There was no possibility that the kitchen could know about my recent duck leg cooking jag, so we all had a laugh at this choice. I love crispy confit, and the addition of the kale and barley was inspired, something I’ll try at home. We were each served a different dessert, and while I tried to keep all of the components straight, here’s where I’ll confess to losing track of everything. It’s one thing to take a few flash-less cellphone photos, it would have been too geeky to start taking notes. 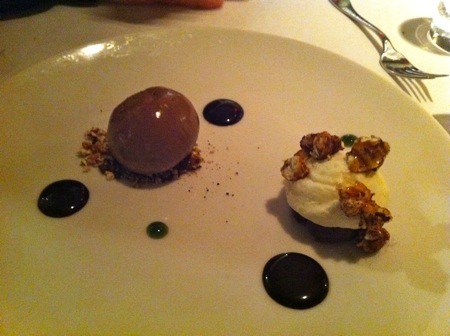 The dessert I recall the least about, this featured chocolate ice cream, dots of green chartreuse sauce, créme chantilly, and cocoa nib coated popcorn. 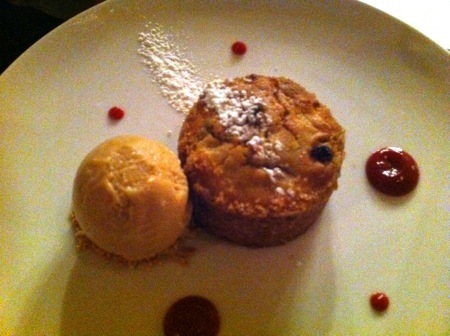 Warm apple-rasin cake with financier sorbet (brown butter and cinnamon). We had to force She Who Must Be Obeyed to share this one. 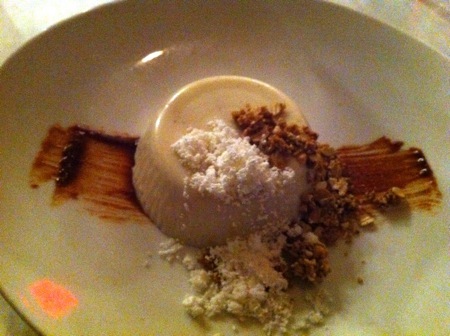 Sour milk panna cotta with cherry coulis, oatmeal crumble, and powdered brown butter. 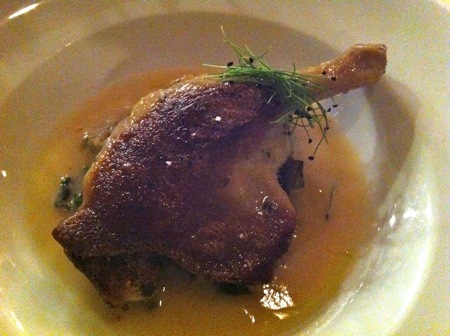 This dish, with variations on the garnishes, has been a mainstay at Craigie. Lastly, chocolate bourbon pecan ice cream cake on a – wait for it – bacon and chocolate crust. We all fought over this one; how could anyone refuse the power of that combination? The current hot chef’s biography is titled Blood, Bones, and Butter, but if I ever get to a point where I’d write mine, Chocolate, Bourbon and Bacon is already on the short list of titles. We had booked the last seating at 10 PM, consequently we did something I had never done before: closed the restaurant. I’m not sure I’d like to make a habit of it – we didn’t get home until midnight – but it was worth it for an excellent meal, much better than the usual Restaurant Week bait and switch. 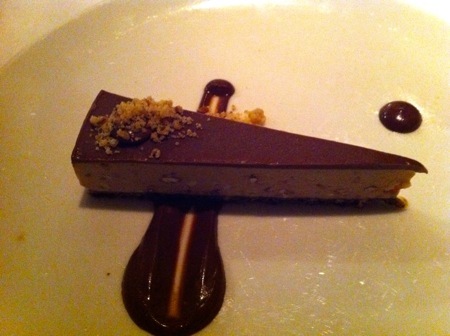 This entry was posted in review and tagged food, local. Bookmark the permalink.